They can also practice these skill sets without committing to them, and can return to their individual producer role, and explore other aspects of “leadership” or “management”, knowing what they are expected to do to perform in these roles. The design allows for multiple people to “oscillate” in and out of management and leadership roles. Or draw from a pool of people who are confirmed able to perform a leadership/management role, thus reducing risk and waste in the strategy-setting process or the strategy execution process. 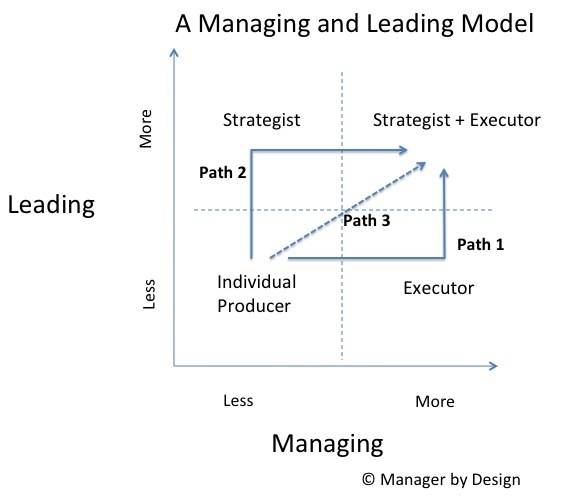 Once someone has demonstrated this ability in both leadership and management, they can then do the “advanced” move of being both a strategist and strategy executor at the same time. This design doesn’t require this graduation to the “advanced move” and instead allows for “leadership” and “management” to be performed by those whose strengths are in the appropriate areas. This isn’t a design that all organizations should follow, but perhaps it is one to experiment with and consider. It’s not that the existing “designs” are that stellar! (See the cost of low quality management). Does your organization have the ability identify those who are good at strategy, and let them develop it, try it and master it? Is this a design you have seen in action? 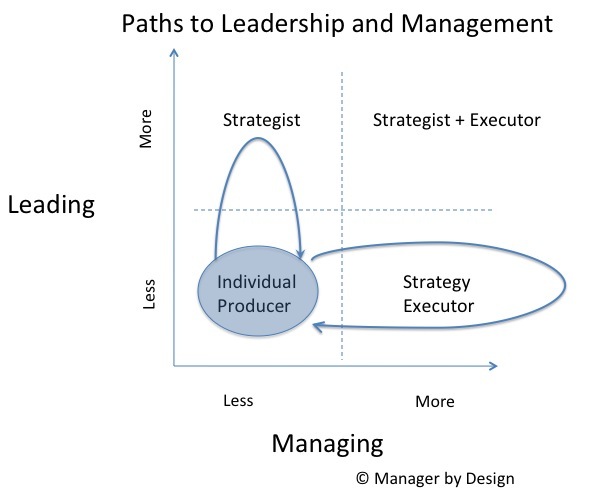 Or does your organization have the typical design of asking a promoted individual to try to be both a manager and a leader and risk being bad at both?